We’re moving right along in the school realm. I am learning that I need to try to find a balance between schooling and housekeeping. It’s the quintessential battle — juggle two important tasks. I’m spending 4-5 hours each day teaching. We try to get started by 9:00 a.m., but it’s 12:00-1:00 p.m when we’re done. By the time we eat lunch, the three year old is ready for a nap. Then, the afternoon quickly disappears and evening is upon us. Because of school, my house is a mess. Dust is gathering, and it’s gotten so bad that I recently declared a “teacher work day”! There’s nothing worse than being cooped up in a junky, dirty house all day. Even with all the dust, however, the last several school weeks have been very fruitful. We’ve finished our study of the alphabet, and as promised, took the boys to the Ft. Worth Zoo. Although a little bit more expensive than Dallas or Tyler, it was very much worth the money. Most every exhibit allowed visitors to get close to the animals. Creepy, disgusting spiders, frogs, lizards and snakes thrilled the boys, as did the gorillas, kangaroos, and tigers. We also rode a train throughout the park, which was a real treat! Aside from the animals, one of the neatest things we saw was the western town in the middle of the zoo. Stores with candy, ice cream, souveniers, and restaurants lined the street. The children’s petting areas and other opportunities for the kids to learn about farm life were also great. Don’t you think the giraffes look like the Cingular wireless commercials?!!! 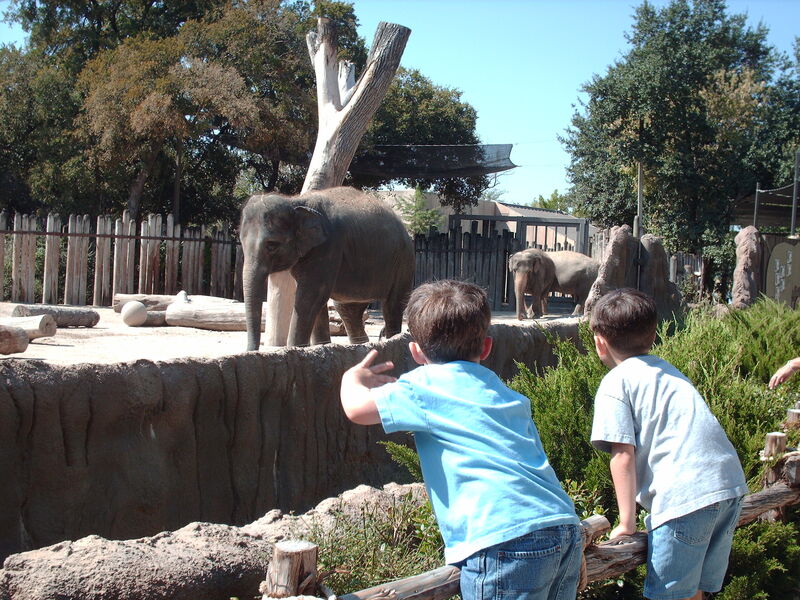 The Fort Worth Zoo is very nice, and also teacher/student friendly. Another nice place to go that’s close to that zoo is the Botanical Gardens. It might not be as much fun for the boys, but a learning adventure nevertheless. It was good to see y’all last night. I’m sorry I didn’t have longer to visit. Julie — so glad you stopped by. I just LOVE the Fort Worth Zoo. At of all of them in the area it is by far the best and oh…so much fun. It looks like a lot has been done since the last time I was there (say 10 years — HA!). I just gotta go again soon. Perhaps in a couple of years when my grandbaby will be three… Love ya bunches. Grace in cleaning your home! Oh, I want to go…I’m trying to talk Mike into going, he’d rather go to the Dallas World Aquarium. Guess either place would be a learning experience 🙂 Teacher in service days are sometimes required, it’s kind of difficult to be a Titus 2 and Proverbs woman!!! Yep, I admit, when homeschooling, “something’s gotta give,” and around here it’s usually the housework! But, hey, it’s worth it, even if your house does get a little dusty! Your trip to the zoo sounds wonderful. It’s so good to get out and do field trips like that with the kids. Great pictures! The boys are growing fast! So do you have asthma? Leslie – Thanks for pointing out half off days! We are fervently praying for you this week as you bring Nandini home! May God bless you with safety and protection on your journey! Dale – We enjoyed seeing you too! Brett loves the puzzle you brought by. “Uncle Dale” will always be special in his heart! Johnnie – You are old enough to have a grandbaby?!! Janet – You are right! It is worth it to school before housework! Our five year old has just finished his first reader lessons, and is so excited to read to us for a change. In Sunday school, he even read his memory verse to the teacher this morning! This homeschooling thing is growing on me! !